It has been a little over a year since I adopted this beautiful AARB beagle on April 13, 2014. Since that date my family has been more than complete. I am very fortunate that I found this rescue and was able to help a sweet, sweet little girl. My Miss Mary fist came to the rescue from a life of hardship. I stumbled upon this rescue when looking for a friend for my beagle that I had rescued from the Nebraska Humane Society. So upon spending months looking and looking and going through the adoption process, my husband and I fell in love with Mary. My husband said it was her absolute gorgeous golden eyes. He looked at her and was like "WOW! Look at those eyes!" Going through the process of adopting was great. This rescue makes you feel so comfortable and I never questioned anything throughout. When the day came and we got the date that we were going to get our little girl we were so excited. We talked with her foster mom weekly, if not a couple times a week. Then the day finally came. Mary had to be transferred from Pennsylvania to Michigan. With the help of beloved volunteers, which I Thank you so much, we were able to drive an hour and a half to just outside of Michigan to Indiana to get our girl. We drove down with our beagle boy Ruppert, to meet his new sister. He was so excited in the car, he could hardly contain himself. While waiting for this little girl to show up we were very fortunate to meet even more volunteers of this amazing rescue that where helping another pup get to her forever home. Then the car pulled into the parking lot. We got Ruppert out, and then the volunteer came over and opened her passenger side door and there she was all snuggled and sleeping still, Little Miss Mary, such a sweet, sweet, girl. Apparently she slept the whole way!!! She got out of the car and Ruppert immediately greeted her and became -from that day on- very attached to her. She was such a sweetheart. As the volunteers proceeded to leave and create more happy memories with more pups we spent sometime with our pups and then we journied back home. Again she slept the whole way home. When we got home she got to meet the dachshunds that lived with my parents and everyone got along great!!! We gave Mary a new scarf and just let her get used to her surroundings. That first night my Ruppert and my Little Miss Mary and I lay down and relaxed. Mary stretched out in between Ruppert and I, and the next thing I know she was snoring in complete relaxation. We could not have expected to receive such a good sweet girl. She is daddy's little girl in our family and my little snuggle bug. She loves to be right next to me and under some warm blankets. Two months after we got her, we took her and Ruppert camping and she did wonderful. She slept the whole time, even in the canoe!!! I could not have asked for a better pup. She fits in so well with the dachshunds. Ruppert is her keeper, he always make sure he knows where she is. We have had an amazing time getting to know her. Our friends are always like "Oh, Little Miss Mary!!!" Mary has come leaps and bounds. She listens so good that we don't even have to have her on a leash. She stays right by us. She is quite the hunter in the fenced in yard. She is aways trumping the boys in the hunting department. Come November 2014 we were lucky to rescue another pup, though it was not a beagle, it was an old coonhound from the local pound. Since we have adopted the coonhound him and Mary has been attached at each other hips, along with Ruppert. It’s our tri-colored pack. Mary has become a great Michigan State Spartan fan, sporting her cheerleading outfit every game day. She loves her sweaters and loves to be snuggled. As April 13, 2015 approached we were very excited to celebrate Mary’s first year with us. We use that date as her birthday. We got her a very cute birthday tutu. She got a spa day with our groomer and an ice cream party with her brothers. We are so happy with adopting Mary and we look at the website daily to see if we can help with anything. Mary, though she has been through a rough life both physically and mentally, she has been a very healthy and happy pup. We are just very happy to help an old folk pup like herself and her brothers. We thank her foster mom, who has done wonders with helping animals in need and stay in great contact with her to let her know everything that is going on. We look forward to many more years with this sweet, sweet little snuggle bug. And we thank MW BREW for what they do and for providing us with a great dog. We highly recommend you to other people and we look to work with you more in the future. 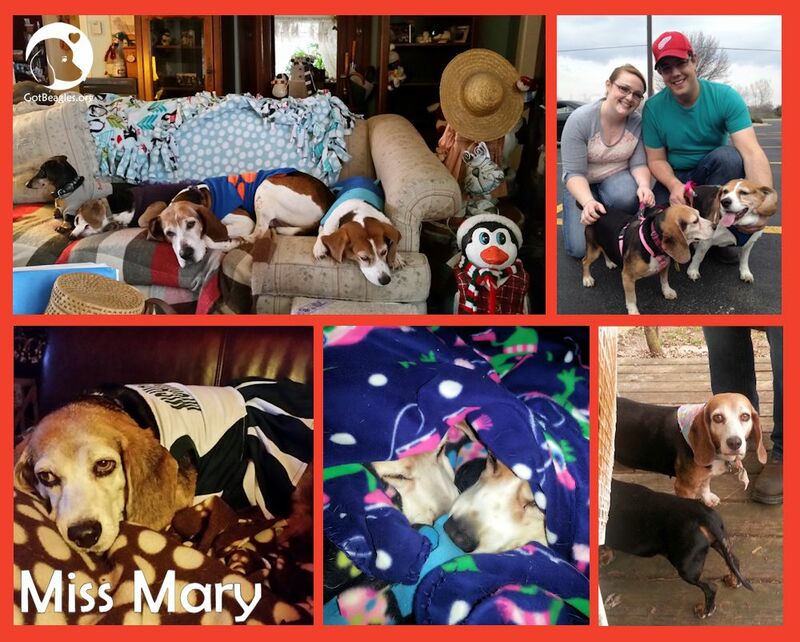 Hopefully we can bring Mary down to Beaglefest to show how well and happy she is. Thank you so much and Mary thanks you too.